Especially if you’re anxious to escape a confusing situation or end a conversation before it even begins! Most of the time you want your conversations in Mandarin to last longer. You want to practice. You want to use the language you’re learning to communicate with people. And routinely blurting out 听不懂 tīng bù dǒng when you don’t understand what someone says gets in the way of that. Well, the first thought that a “听不懂 tīng bù dǒng” might trigger in the head of a native speaker, is that you pretty much don’t understand ANY Chinese at all — they’ll assume you’re not ready or willing to give the conversation a shot. So, how do you avoid that scenario and encourage people to continue talking to you in Chinese? How do you help them help you get the message? Did you notice how the listener in the video used different phrases to trigger different responses from the speaker? Let’s look at how YOU could apply this to your own conversations. 不好意思！我没听清楚。 bù hǎo yì sī！ wǒ méi tīng qīng chǔ. Sorry! I didn't hear (you) clearly. 麻烦你再说一次！má fán nǐ zài shuō yī cì. ​What? What did you just say? 什么什么什么，请说慢一点！shén me, qǐng shuō màn yī diǎn! ​What? What? What? Please speak more slowly! 我听得不太明白。wǒ tīng de bù tài míng bái. ​Can you put it another way? __________ 什么意思？ __________ shén me yì sī? ​​What does _________ mean? / What do you mean by _________? 你的意思是(说) _________? nǐ de yì sī shì (shuō) ___________? ​​So what you’re saying is ________? / So, what you you mean is that _________? When you struggle to understand what someone says, it’s good to get SPECIFIC. The questions above can help clarify why or what you don’t understand. And this will make it easier for the speaker to meet you where you are. This is not always straightforward — especially outside the “safe environment” of practice sessions with language partners and teachers! 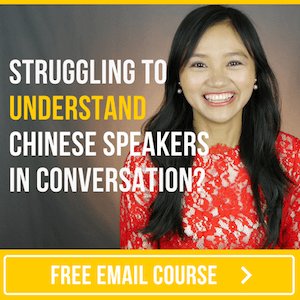 That’s why it’s important to not just rely on “conversation strategies” and actually focus on learning to understand Chinese as it’s spoken in the real world. 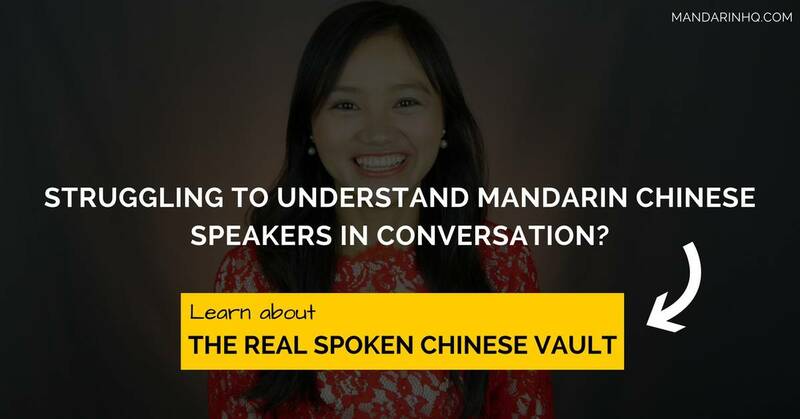 If you’ve been following me for some time you may know that I created “The Real Spoken Chinese Vault” to help with this exact challenge. How do you deal with situations where you have trouble understanding what someone says to you in Chinese? Do you think any of the phrases from today’s lesson might come in handy in future conversations..?